Coal is a major contributor of global warming. Power generation through coal is inefficient and dirty. The use of coal has major risks for the environment and the health of our communities. While there has been no Australian overview of the health effects of coalmining on inhabitants of coalmining areas, evidence from the United States[i] indicates that coalmining communities had an increased risk for developing cardiopulmonary disease, chronic obstructive pulmonary disease (COPD), hypertension, other lung diseases and kidney disease[ii] . Coal-processing chemicals, fumes from diesel powered equipment, explosives, toxic impurities in coal and dust from uncovered coal trucks affect the health of our communities. According to the World Bank 80% of known fossil fuel reserves must be left in the ground to avoid catastrophic climate change. Its executives back the withdrawal of funding from coal companies[iii]. Indian-owned coal giant Lanco is planning a significant expansion of its existing coal mining operation in Collie. The expanded mine would supply 15 million tonnes of dirty coal per year to be exported through Bunbury, our major tourism destination in the southwest of WA. The transport of coal through Bunbury will turn the town into a dirty coal port and risk the health of communities through exposure to coal dust. In addition, the coal mine expansion could have a major impact on groundwater and farms in the Collie region. We are working inside and outside parliament to prevent this proposal from becoming reality. The Duchess Paradise Coal project plans mining of 70 million tonnes of coal, generating 283 million tonnes of CO2 and using 4.1 million litres of water per day. In July 2013 the project was sold to Hong Kong's Crystal Yield Investments for $21 million. This projectthreatens two National Heritage-listed sites - the iconic Fitzroy River and unique King Sound and must be stopped. At Federal level the Greens introduced a Bill to give all landholders across Australia the right to say no to coal and gas mining on their land. We have viable renewable energy alternatives and that there’s no excuse for threatening our water, land, climate, food security and rural communities. 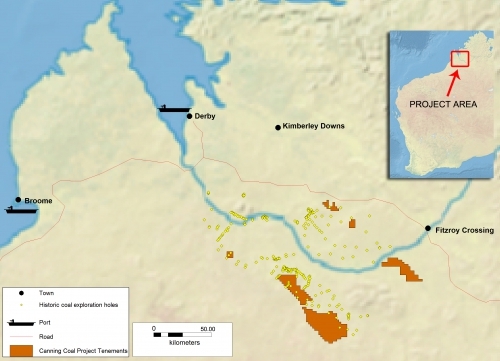 Geologist, stockbroker and corporate analyst Peter Strachen spoke to ABC Kimberley about the possibility of a coal mine in the Kimberley. He said due to global economics, falling coal prices and the high cost of mining so far away, coal mining isn't viable. For the full story click here.